Sushi Hotaru has been popular for as long as I remember, if you go during lunch time or dinner time, a wait is to be expected. The most recent time that I visited was at 4pm on a weekday, and there was still a wait, just goes to show how much Melbournian love cheap sushi trains that’ll only set you back $3 per plate I guess. Fresh scallops are lightly caramelised with a blowtorch, and with a sprinkle of spring onion on top, these were a delight to eat. 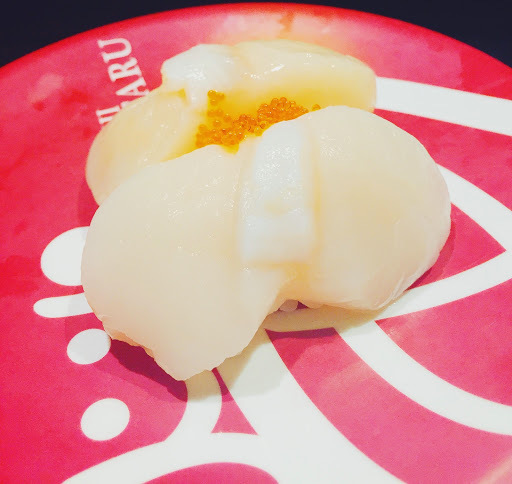 The fresh scallops nigiri was equally as good, the sweetness of the scallops were really prominent, and was accentuated by the fish roe on top. 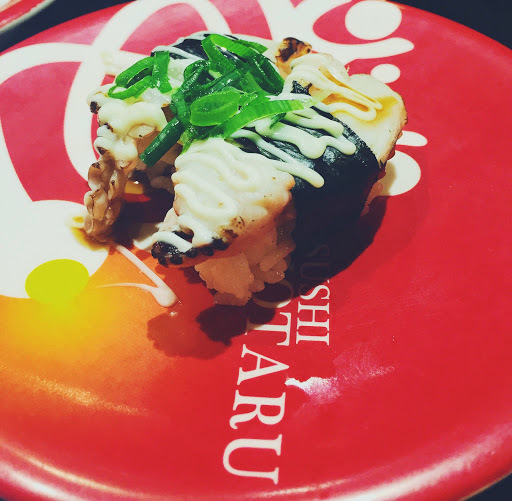 The grilled squid/octopus was a little chewy, I got this one off the actual sushi train and it was pretty average. All was good again with the seared salmon nigiri though, the smokiness was more prominent in this than the scallops, probably because of the fattiness of the salmon? 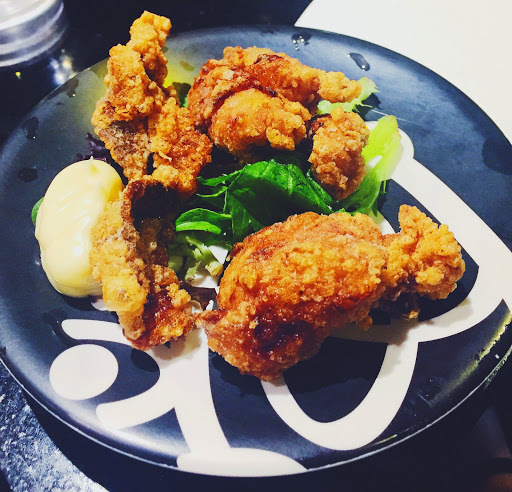 The chicken karaage used to be one of my favourites, who doesn’t love some fried chicken? However, they have slowly transformed from small chicken pieces to two large chunks, although the batter is still reasonably nice, it definitely has gone down hills. 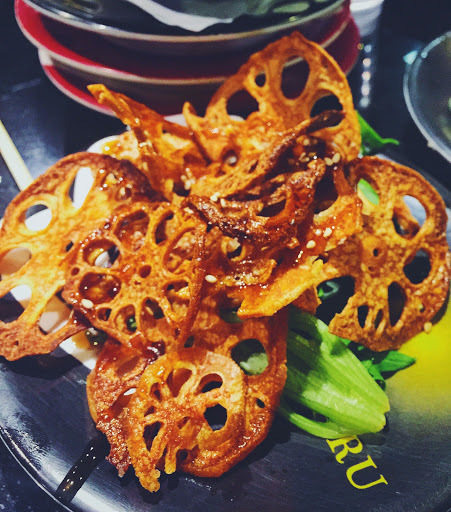 The lotus chips is another thing we always gravitate towards in the side dishes section of the menu, deep fried, drizzled with sweet soy, and a scattering of sesame seeds, what’s not to like? The serving size has also downsized, on a side note. 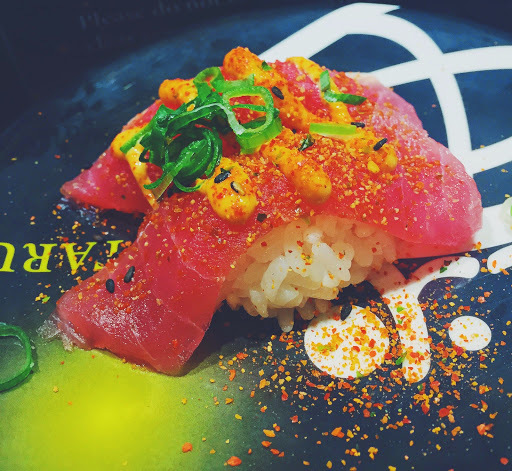 The plump pieces of tuna were topped off with some spicy mayo, and it was a pair of simple but flavoursome nigiris. This was the first time I’ve ordered the soba, and it was quite a generous serving for $3. 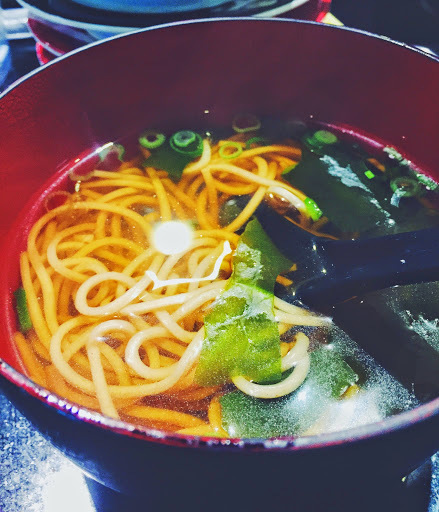 The soba was still springy, and although the soup lacked a depth of flavour, it was light enough to be pleasant. Mmmmm by now, you should know my (and the entire Melbourne’s) obsession with soft shell crab. 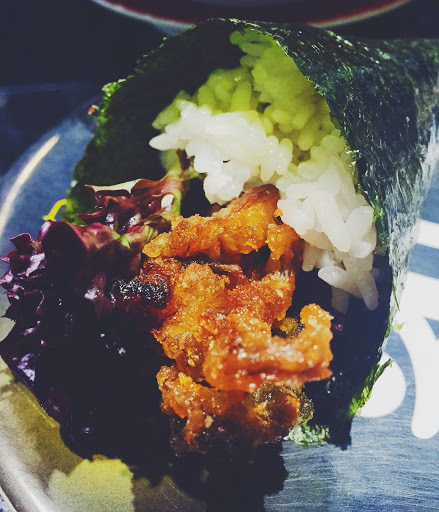 Wrap it up in nori with some rice, salad, and tartare sauce, although messy at times, it’s always a delight to eat. More soft shell crab, ’cause I can never say no to that stuff. Two blocks of agedashi tofu were served in a light sweet soy broth, along with half a soft shell crab. 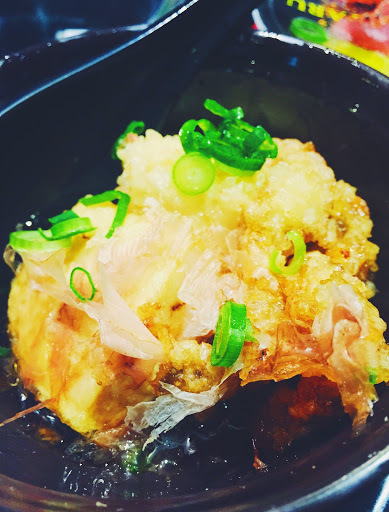 The batter on the agedashi tofu was quite soggy, but it was still an alright dish, mainly due to the crunchy soft shell crab DUH. 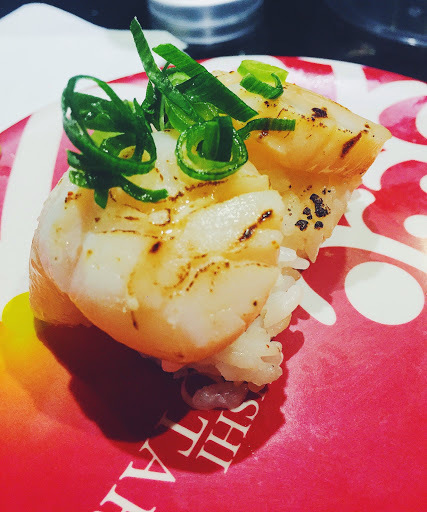 I’ve visited Sushi Hotaru on several occasions now, and the service has been a bit of a hit and miss. They have a weird rule that only a group of four can sit in the booth, even if the restaurant is half empty, which makes absolutely no sense to me. That clearly doesn’t bother me that much though, since it never fails to lure me in when I’m craving some sushi. 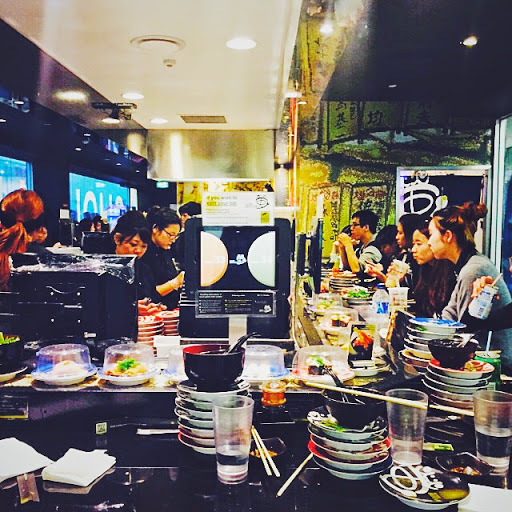 For $3 a plate, none of the array of sushis and side dishes can be faulted really. Oh, the whole group has to be there for you to be seated, so yeh, make sure the whole gang’s waiting together, and be ready to stack up some plates! 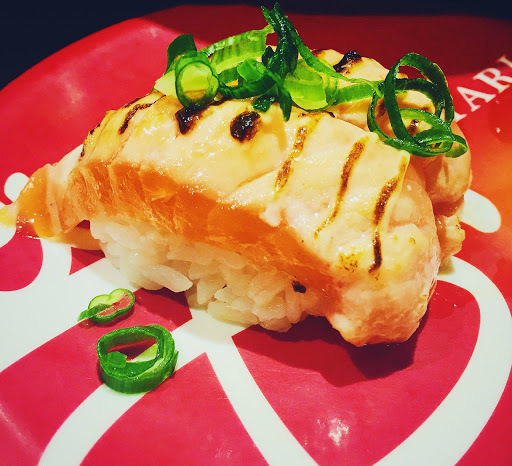 Sushi Hotaru is located in Chinatown, first floor in the Mid City Arcade.